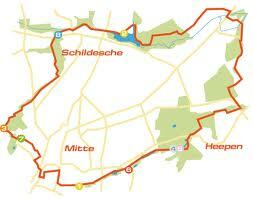 Bielefeld has a number of nice cycle routes to choose from. The weather forecast for tomorrow is hot, hot, hot. What better way then to beat the heat than to feel the breeze on a bike tour along Bielefeld’s network of green cycle routes? Das Grüne Netz or Green network is basically a 25 kilometre circular route through traffic-calmed roads and green spaces with interesting sights along the way. It is suitable for families and there is the extra bonus that 24 playgrounds just happen to line the route and even a mini-golf course! If you start off from Ravenberger Strasse, which is on “das Grüne Netz” like our family did last Sunday, and follow the road East you are soon away from the city and cycling along the path of the river Lutter and its three (rather picturesque) ponds called, rather unimaginatively perhaps, Stauteich I, II, and III. Before you reach Stauteich III, you will see the mini golf course on the left hand side. Past the ponds the landscape opens up to wide meadows. As you near the Meyer zur Heepen Hof, an 18th century wooden timbered house and mill, you are surrounded by forest. This cycle ride was about 4 kilometres one way, and our 7 year old can manage it comfortably. We took a detour from the route to go to Heepen, a little village in Bielefeld to be rewarded for our efforts in a great Italian Ice cream shop there. It is a good idea to bring a picnic/snacks with you, as cafes on route are few and far between. There is a leaflet that describes the route in the tourist office, but, unfortunately, it is only in German/Dutch at present. There is, however, an interactive online map online and an app to download called teuto_navigator , where you can at least see the route. To be honest, although it is nice to have the map, at least on this stretch of the route, you just have to follow the joggers, Sunday strollers, and other cyclists populating the route. In our experience, there are always enough people around to ask if you get lost. I have just seen on the Bielefeld Uni website there is an amazing offer of free bike hire (deposit 50 Euros) for up to a year for international students, scientists and scholars. Has anyone used this service? Here is a bike hire service near the main station, recommended by Bielefeld.de. Does anyone have any other experience of bike hire in Bielefeld? And by the way, tomorrow (Sun. 9th Sept) is Stadtwerke Run & Roll day in Bielefeld, which is also good news for cyclists. Every year at the beginning of September part of the motorway is blocked off to traffic for various sporting events and family activities so you can head down there with your inline skates, bikes and trainers etc. Here is map of where the event takes place. No, the other kind of football! Last Saturday, my husband and I were walking through the Jahnplatz when we spotted some guys in American football uniforms! They invited us to come see them play the next day. This was exciting for us, as we didn’t realize anyone actually played American football here. I’d finally gotten used to ‘football’ meaning ‘soccer’ in my mind, and accepted that nobody else in the world really cares anything about our sport. But here they were! Naturally, we went to the game. They are called the Bielefeld Bulldogs, and their home base is Rußheide stadium, which is easily accessible by several bus lines. Even though it was a rainy day, the stands were covered so it didn’t deter us. The guy at the Jahnplatz was a recently-graduated American, who played in college and then moved over here to help grow the sport in Germany. He told us that only 4 Americans are allowed on each team, and only 2 can be on the field at a time. At the game, we noticed that the Americans are identified by a huge “A” on their jerseys, and on their helmets. It actually felt a little weird to see that, being labelled and regulated like that. I hope that if the sport grows over here and there’s more training for Germans, they won’t need to do that anymore. We had so much fun! The stands were packed, and our home team is currently undefeated! They won 70:6, a score I’ve never seen before! There were even cheerleaders. And if you’d like to come to a game, let me know!